May 5th - New starting goalie Scott Darling signs a 4-year deal. June 12th - Defenseman Jaccob Slavin agrees to a 7-year extension. July 1st - Stanley Cup hero Justin Williams is coming home. July 13th - Initial reports leak that Peter Karmanos may finally be close to selling the team. August 1st - Defenseman Brett Pesce agrees to a 6-year extension. Brief apologies to the likes of Trevor Van Riemsdyk and Martin Necas and Eetu Luostarinen (Eetu especially), but it's those other five notables that have people buzzing, or me anyway. There is an indisputable momentum with this franchise right now. It's youthful, it's invigorating and it's full of promise for the immediate future. No more rebuild, this team is ready to arrive, now. The common thread throughout all the signings - the notion that Ron Francis has assembled a roster to be reckoned with. Scott Darling called it a "no brainer" for him to sign here. Yes, that was largely a comment based on getting a shot as a full-time No. 1, but he had to know he wasn't throwing himself to the wolves here. Slavin and Pesce being locked down for the next 7 seasons at a reasonable sticker price is foundational. They got big money, but barring an unforeseen change in career trajectory the Canes have guaranteed themselves a smothering top defensive pairing with significant offensive upside (looking at you here, Jaccob) for the next near-decade. 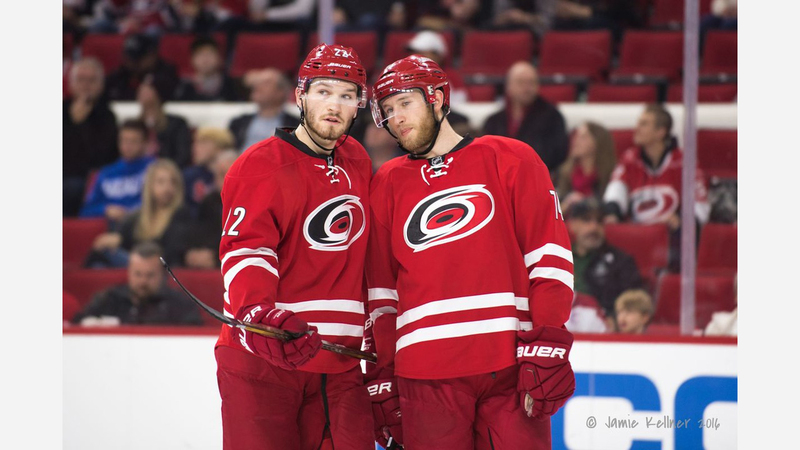 Both Slavin and Pesce could've waited on signing a long-term deal. Both chose to remain here, for multi-millions, yes, but I think that says something about how they view the team's prospects internally. No one wants to be marooned on a team going nowhere, millionaire or not. Justin Williams told me directly that within the league, among players specifically, the Hurricanes are viewed as a team on the rise. While others more removed may have questioned his choice, he said his colleagues know exactly why he opted to return to Raleigh. That's a base level of respect and recognition from guys who aren't going to blow smoke up your shinpads. That brings us to the ownership situation. Peter Karmanos brought hockey to North Carolina and you'll pry it from his cold, dead hands! Not really of course, but I think even Peter would agree at this point that a sale would be mutually beneficial to both him and the team and its fans. Chuck Greenberg's rep as an intensely fan friendly type certainly sounds great, but the question remains whether or not he can scrape together the cash. $450-500M is no pittance. Karmanos told Chip Alexander of the News and Observer that his favorable view of Greenberg has bought the Texan some extra time to arrange financing, but intimated strongly that the clock is ticking and even said he might raise the price if this sale falls through. It's the saber rattling we're used to with Karmanos, but this time I think he'll lay his sword down. It's time for him to hand off and the team's fortunes to really take off.